Co-sponsored by the Center for Information Technology Policy (CITP), the Program in Law and Public Affairs (LAPA) and the Woodrow Wilson School of Public and International Affairs (WWS). Free and open to the public. 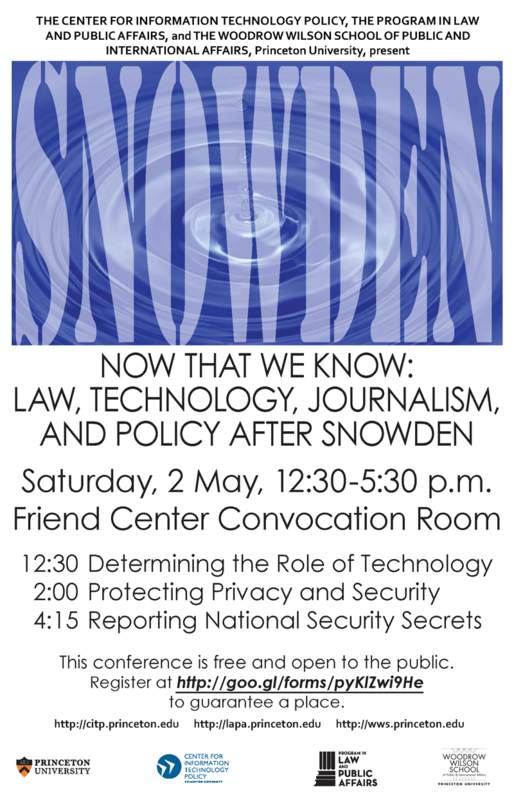 As part of the ongoing conversation at Princeton University about privacy and security, CITP, LAPA and WWS are holding a conference to discuss the impacts of the Snowden disclosures on technology, law, journalism and policy. The event brings together experts in computer science, journalism and law from government, the private sector and the academy to provide a comprehensive view of the current state of affairs and to offer a diverse set of perspectives on where we should go from here. The day’s events will explore how to ensure simultaneous protection of national security and other important values, including personal privacy, the right of citizens to know what their government is doing and security of the internet itself. By cutting across disciplines and incorporating a wide range of viewpoints, we hope to generate policy proposals to address the issues raised by both Snowden’s actions and the information he revealed. These events add to others we have organized at Princeton this academic year that have touched upon national security and civil liberties, including “Challenges and Opportunities in an Interconnected World: A Conversation with Admiral Michael Rogers, USN“; the public talk on “Privacy and National Security” by George Ellard, inspector general of the NSA; and the ACLU Conference: Civil Liberties in Times of War. 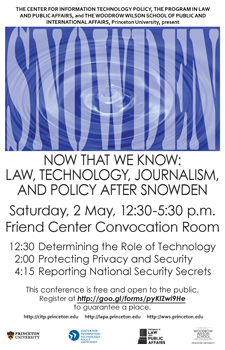 The Snowden conference provides a venue for interdisciplinary discussion on cybersecurity, surveillance, national security, investigative journalism, and individual rights.